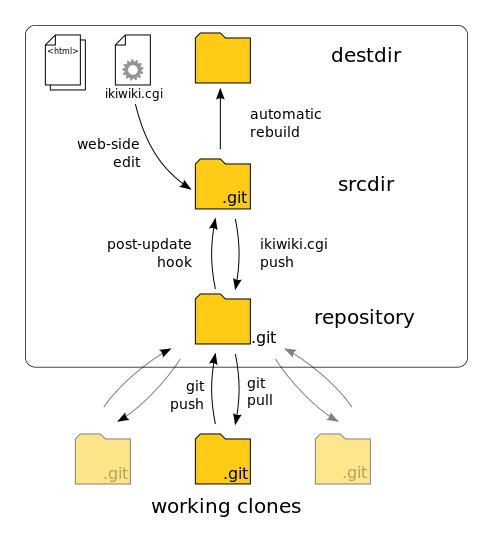 If I have a local ikiwiki on my laptop I need a "repository" directory (mywiki.git - a bare repository), a "scrdir" (myiki a git repository) and a place where the produced html files go ("destdir") to run it properly from a web browser locally. With this approach, I need three almost identical directories on my laptop just to run one wiki, i.e. it occupies three times the disk space instead of just once. Is there a safe way to circumvent this if you are just working on one machine, to reduce it to just two or even better one directory? I have successfully used ikiwiki with 0+ repositories. 0..2 are single-user, so I have not run into conflicts (yet). 0..1 were just an experiment with ikiwiki. With 3+ we are going multiuser, so I expect it is going to be more interesting. If you are directly editing ikiwiki srcdir you will run into a conflict if the same file is edited by web-ui (or pushed to bare repo by other users). If you commit in srcdir, conflict will be handled by web-ui. But any uncommitted changes to the file will be lost. If you are not using web editing feature, and there are no other users committing to the repo, you are fine with 2 repos. And even 1 might work. Or 1 with remote repository. Also I guess it would be easy to write a plugin to stash any changes before srcdir is updated/reset. It does seem excessive. It may be possible to deal with only one git repository. That all depends on the capabilities of the ikiwiki infrastructure (of which I know nothing about). The reason you'll want the repository to be a bare repository is because a non-bare repository almost always will have a branch checked out. Other git repositories will are not allowed to deliver to a branch that is checked out on the destination repository (imagine working on the branch, a push happens to your machine, and files get changed from under your nose). You may be able to work out of the srcdir instead of cloning the "repository" one. Although this may cause a resource contention if you can modify the files at the same time that a web-side edit can. Also, it could get messy with you pushing manually and having the ikiwiki.cgi pushes happening too. The ikiwiki may put in hooks you don't want running on a push. For this reason, I suppose they recommend you clone from the "repository". HEAD and everything under objects and refs directories. The excess disk space is not in the .git/objects directory, but rather in the checkout itself. If that's still too excessive for you, then you may want to continue looking for another solution. Unless you know a lot about the inner-workings of ikiwiki, I wouldn't attempt to circumvent their recommended way of setting it up. I would consider it unsafe. If you want a better answer than that, you may want to go to a better forum with more knowledge about ikiwiki. The extra used disk space is less of an issue when you realize git performs hard-linking of the internal git object files. Not the answer you're looking for? Browse other questions tagged git ikiwiki or ask your own question. How to use git for this particular purpose? How to exit a git merge asking for commit message? Git commit using stdout from bash?